The #BYOD4L event took place this week. One of the aims of the five-day long online course was to encourage collaboration. Brian Kelly and I have agreed to collaborate by writing gust posts on each others blog. My post is available on the UK Web Focus blog and Brian’s post is given below. What Was The BYOD4L Event About? The BYOD4L (Bring Your Own Device for Learning) is described as “a truly open course, or an ‘open magical box’ for those who don’t like the term ‘course’ very much, for students and teachers (nothing is locked away or private and you won’t even need to register) who would like to develop their understanding, knowledge and skills linked to using smart devices for learning and teaching and use these more effectively, inclusively and creatively“. This post summarises my reflection om the potential of smart devices in a learning context, the opportunities available and the challenges to be faced and details of a new BYOD tool I came across this week. I should also add that although BYOD4L does not describe itself as a MOOC the approach taken and the tools used had many similarities with the HyperLinked Library MOOC in participated in last year. Perhaps Mini-MOOC might be a good description of BYOD4L, if you’ll permit “Mini-Massive” in the abbreviation! The five day event sought to encourage participants to publish their thoughts and engage in discussions on five topics, which were accompanied by a blog post published each morning during the week. The topics were (1) Connecting, (2) Communicating, (3) Curating, (4) Collaborating and (5) Creating. It was difficult to engage fully in these activities on a daily basis, whilst still doing my day job! I therefore didn’t watch all of the videos which accompanied these themes. However I do feel that the event organisers provided a useful structure for helping to consider the role which using one’s own mobile devices may have in enriching learning. I have written two posts this week related to this topic: one on “Buying a New Tablet (Useful for #BYOD4L)” and the other on “Responding to “I Don’t Have Time!” Comments“. In this post I will give my thoughts on the five issues. Whilst the Social Web is not new, mobile devices enabled connections to be made, in the words of the old Martini advert, “anytime, anyplace, anywhere“. I have experienced the benefits of making new connections using mobile devices. The ability to be able to follow someone who has posted a link to an interesting article, shared useful resources or providing valuable insights into an area of interest to me whilst away from my desktop PC is useful to me. However people who worry about having too many people to follow do have a legitimate point, although this can be addressed by a periodic culling of one’s network, which might be particularly useful when one’s work activities change. Although mobile devices can be useful when one is on the move, they can also be useful in other situations as I described almost two years ago in a post on how Twitterers Do It In Bed! Since publishing that post on a number of occasions when giving a talk about social networking I’ve asked for a show of hands of people who have used a mobile device for work-related purposes while in bed: it has been interesting to see the people who put their hands-up straight away, those who reluctantly admit to this, seemingly feeling guilty about it and the look of horror on the faces of others who have never considered this! Having worked at UKOLN for over 16 years I am very aware of the importance of content curation. Although Twitter can be regarded as transient conversations I have been aware of the value of curation of tweets for some time. When I facilitated a workshop on Wikipedia editing for the first time I encouraged the participants to tweet during the workshop. Shortly afterwards I used Storify to create an archive of the tweets which I’ve used to evaluate the event, the structure and the timing. I was very pleased to see that the BYOD4L organisers provided Storify summaries of the first and the second Tweetchats which they organised which was published shortly after the Tweetchats had concluded. In less than 30 minutes I had been alerted of a new video conversation tool, found someone to try it with and shared our experiences. Collaboration in action! In the video conversation we identified some possible uses for the appear.in tool: unlike Skype, no software needs to be installed and unlike Google Hangouts you do not need to sign up to the service. I also tried the service on my mobile phone, but found that the video wasn’t working (the black box in the screen shot was were the video from my phone should have been displayed). 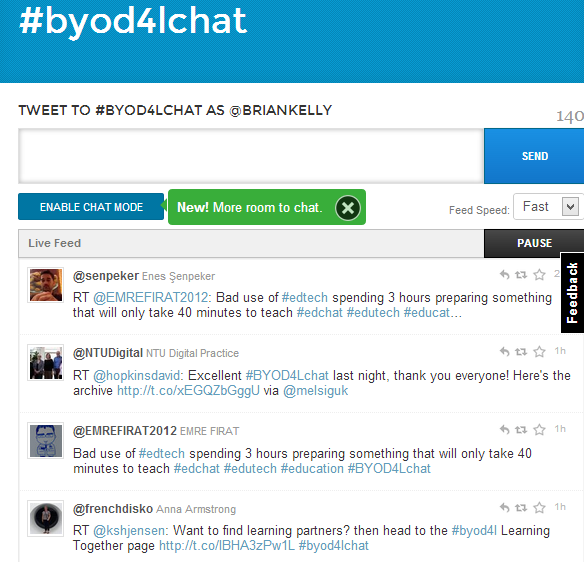 I created the #byod4lchat Twubs archive, which complements the #byod4l archive. Since the #BYOD4L event is about mobile devices, I should confess that I created this archive on my desktop computer. However I did posts several tweets from my phone, so I feel that I have contributed to the five areas! Last year I took part in the Hyperlinked Library MOOC. This provided a valuable opportunity for me to both learn more about MOOCs and learn about the HyperLinked Library model and the ways in which libraries can exploit networked technologies in order to enhance their effectiveness. I enjoyed the experience. I was conscious of the time it took to view the videos, read the recommended posts and articles and complete the assignments but, as I concluded in my Reflections on the Hyperlinked Library MOOC “if you were to ask me if I would recommend participation on the MOOC to others, my answer would be “Yes!““. The BYODL4L event had many similarities to the HyperLinked Library MOOC. For me the main difference was the focussed approach taken by BYODL4L which lasted for 5 days. How many people were involved in planning and delivering the BYOD4L event? What was the business model for providing this free event? Would you do it again? If so, what would you do differently? What advice would you give to others who were considering organising a similar online event? This guest blog post was written by Brian Kelly, Innovation Advocate at Cetis as an assignment for BYOD4L. Brian normally publishes on the UK Web Focus blog. Previous #byod4l day 3: Curating – so much stuff but how to find and use it? So thrilled with the appear.in tool. Thanks for Communicating your Corroboration and Creating this post. I tutor using only Skype and never meet learners in person. 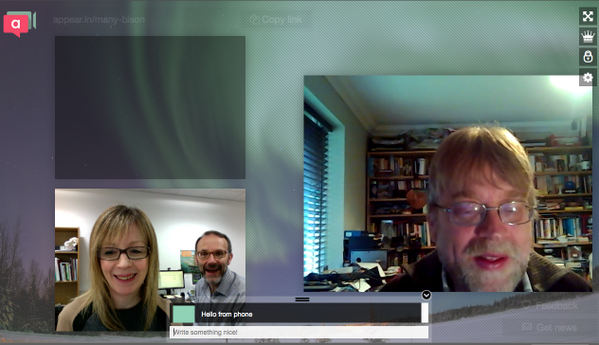 Sometimes I have to talk to the university staff or assessors referring the student to me and they are often “scared” of Skype or restricted by their institution “rules” about using it.This looks a good alternative for meetings with the people involved in the support of a particular learner as they just click the link and nothing is downloaded. I have done some project work on using smart devices on placements with students – I think this tool might be a way forward with the hospital trusts who do not like the idea of Skype for a number of spurious reasons. Often sessions during placement are conversational and discussing ideas and strategies rather than working on documents or Assistive Tech so again it fits the purpose whilst placating the hospital makers of protocols.. Thanks for your comment Kerry and I’m glad you’ve found appear.in useful. Would love to hear more about how you get on with it. Would you do it again? If so, what would you do differently? – we are doing it again. It was designed for reuse and adoption. So now we have 3 universities who will be targeting iterations for local CPD but still with an open door policy. What advice would you give to others who were considering organising a similar online event? – trust each other, have fun, take risks, be open and honest with anyone involved or close by, remember that you can most survive without sleep for one week.